Higher retroreflectivity sheeting enhances the conspicuity of stop signs. 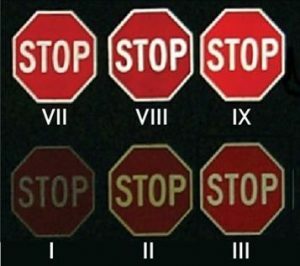 Relative visual comparison of stop signs with different grades of retroreflective sheeting (Persaud et al. 2008). Higher retroreflectivity sheeting enhances the conspicuity of stop signs. In fact, the Manual on Uniform Traffic Control Devices (MUTCD) notes that these signs shall be retroreflective or illuminated to show the same shape and similar color by both day and night. There are many materials currently available for retroreflection and new materials and methods continue to emerge. Retroreflectivity is one of several factors associated with maintaining nighttime sign visibility. Public agencies or officials having jurisdiction shall use an assessment or management method that is designed to maintain sign retroreflectivity at or above the minimum levels set forth in the MUTCD (see Table 2A-3). Stop signs with higher retroreflectvity are placed the same as normal stop signs. Ripley (2005) conducted a benefit-cost analysis for traffic sign upgrade programs implemented by Sioux City, Iowa, Mendocino, California, Putnam County, New York, the Insurance Institute of British Columbia (ICBC), Canada, and other projects that upgraded sign materials. The research evaluated each program and examined the crash results, including crash types, sign locations in relation to the crashes, time of day, light versus dark, weather, and other factors that could influence the effectiveness of signs by establishing and documenting benefit-cost ratio. The authors cited a newsletter indicating that the crash rate on Sioux City streets has fallen from 6.53 accidents per million miles in 1995 to 4.03 in 1998 (-38 percent). The authors indicated that all programs showed crash reductions due to a sign upgrade program. They suggested that a sign upgrade from engineer-grade to high-intensity (ASTM Type III) or Diamond Grade TM (ASTM Type IX) reflective sheeting could bring about improvement in safety while encouraging a positive benefit-cost ratio. Persaud et al. (2008) studied the safety effect of increasing retroreflectivity of stop signs. They analyzed geometric, traffic, and accident data at unsignalized intersections in Connecticut and South Carolina using an Empirical Bayes analysis. The strategy implemented was a blanket application of stop signs with increased retroreflectivity. They reported a 4.4 percent decrease in nighttime crashes, a 2.2 percent increase in rear end crashes, and a 1.2 percent decrease in all crashes.